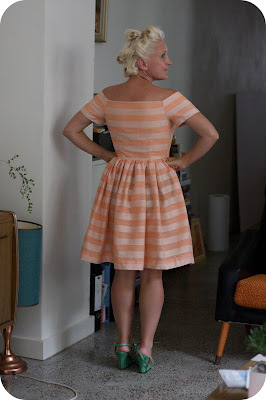 Veronica Darling: Butterick 7181 - TICK! "Dress and Stole: Day or Formal Lengths" 11 Pieces and "Cut low to show off your shoulders" is the description here, and by gosh I think it shows off my shoulders just enough for me to remember why I don't like strapless bras. 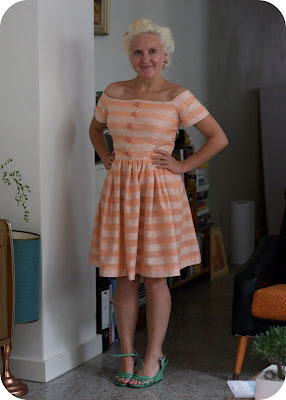 Yay, this darling dress is finished and it's totally taught me a bunch of things along the way! For those of you 'joining me today for the first time', I'm making every pattern that dear penpal Amanda of Adelaide has supplied me (which is 13 patterns from her collection) and talking about the process and giving you a little insight into the pattern. I adore a challenge in the sewing room to keep me motivated and focus, because I turn into a forgetful seamstress and busy lady otherwise. 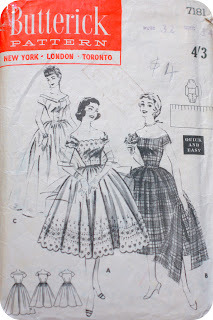 Hence, I'm revealing to you today Round 2 of Amanda's Vintage Pattern Challenge. 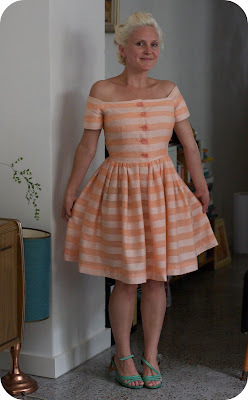 So if you recall, I had to choose this pink stripey stuff, because I thrift/op shop all my fabrics, and I'm on a bit of a stash busting rampage at the moment. Pink candy stripes it was because this skirt has over 2 metres of gathering AND darts in the waist. So that's shitloads of fabric, and by gosh it looks good because of it. The other thing I realised as I started the bodice bits, was that the fabric was quite see-through, and if a girl had to wear a strapless bit of underwear you'd probably want to hide it as well, so I lined the whole bodice with some other creamy pinky stash fabric. AND please allow me to gush at how skilled I am at LINING A FREAKING BODICE! I even attached the sleeves and lined it that way. I can't even remember how I did it now! I think I explained the timeframe in this post, so I guess I did do it and not the Sewing Fairy or Whatever. The other thing I found out about in this pattern, was to do a 'zipper facing'. It's where you get a bit of fabric long and rectangle like (say 3 inches across and 10 inches down), you do only 3 edges (in my case I overlocked it) and then you stick it right sides together to the skirt, and where you want the zipper to be. Stick it, of course, is the 'Veronica Darling Term' for sew it in a really skinny long v-shape vertically down the thing. (Err, this is sounding bad, hey?) Anyways, then you cut in between the v-shape and then you turn the facing inside and iron it flat and you have yourself a dandy little opening in the skirt that's all ready for the zipper. I'm sure if you google it, someone has explained it better than me! There's the side zipper, with the zipper facing, that unfortunately you can't see, but I'm not fond of showing the inside of my things, because they *can* look dodgy. But in my hastiness to 'stick' aforementioned zipper facing to the skirt, I kinda stuck it in the wrong place, and now the seam (vertical again) of the skirt now sits at the front. It is hidden in the gathers, but I'm not altogether happy with it. Oh well!! At least it looks pretty spunky! I just realised how daggy my shoes look since I didn't do them up. My lovely friend took the phots and she did say "You don't want toe strap them up? ", and now I realise how much of dork I am. It's Pincurls Saturday again at my house and I just took them out before and yep... I pretty much look like Marilyn Monroe. Whatever. Notions: Lightening Vintage zipper, Vintage buttons & thread handed down to my stash from my friend's granny's stash. Time to complete: Over 2 weeks, perhaps 10 hours. First worn: Today, just to try it on. Wear again? Nup, not into strapless bras, will be up for sale. Love to you on the weekend! You are my sewing idol!!! I love how much you sew!! 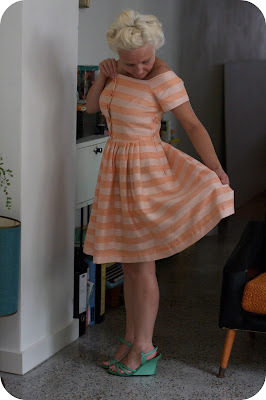 I feel like it takes me sooooo long to sew anything..so visiting your blog and seeing your creations is a total inspiration! Love the dress! It looks so cute!! I can see what you mean about the bra thing though, I would probably never wear it either. Great job though! Dear Veronica I can't believe the garments I see on this blog! It's like you have a window open on my brain^^, I want everything you make! This peach dress is wonderful, I know you're bothered with the skirt's seam situation but I assure you that we can't see anything wrong. Quick, sew other wonders and show us! Um, to damn cute! I think the skirt looks great, I like how the gathered bits thin off at the hips so it isn't too froufrou, perfect. Oh and the neck line! Oh my that dress is gorgeous! What size is it? It'll probably be too small for me which is a bummer cause I totally would have given it a new home for you. Just adorable! Looks great on too! Sending some gush to you! So you think you can sew?